Enfield Town's amazing form in the Ryman Premier Division continued yesterday with a 0-2 win away from home at Peacehaven and Telscombe which pushes them up into fifth place. 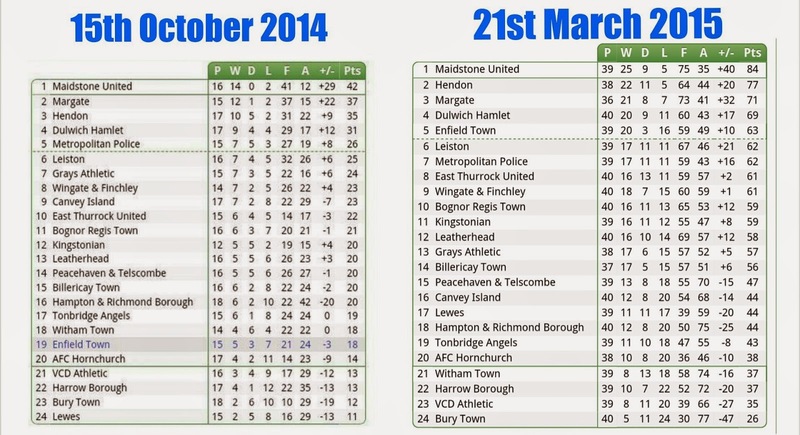 Who would of thought this back on the 15th October 2014 when The Town were down in 19th! The above comparision shows the top four are still the same with just Hendon and Maragate moving posititions and the teams in the relegation zone being the same aside from Lewes who were bottom of the table back in October- they have been replaced in the bottom four by Witham Town.